We hope you enjoy these pictures from Globe Guilders events throughout the year. 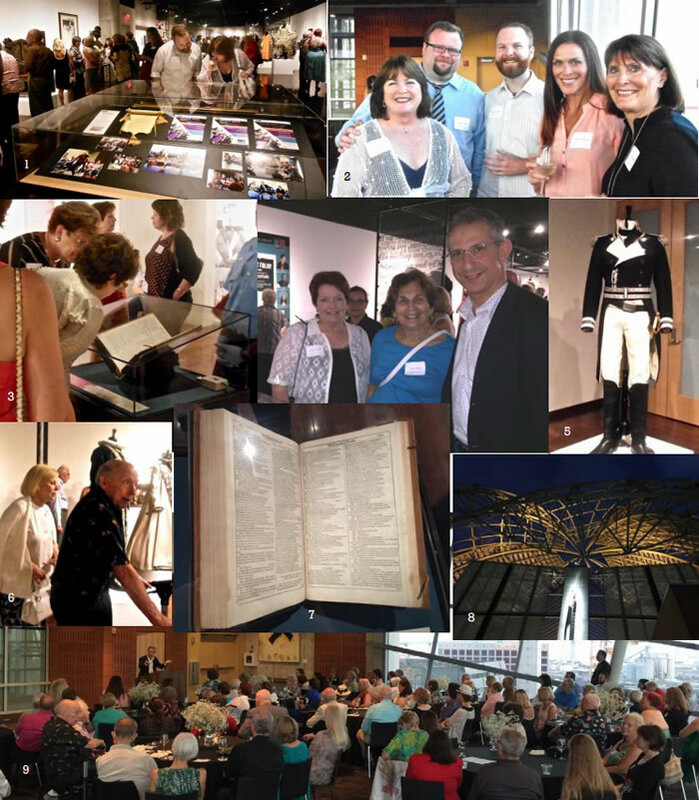 June 29th, 2016 – The exclusive private reception for Globe Guilders and their invited guests to view the First Folio – The Book that Gave Us Shakespeare, was an evening to remember. We enjoyed wine, coffee and desserts while admiring the spectacular city views from the 9th floor of the San Diego Public Library. A supplemental exhibition showcased original props, costumes and photographs from The Old Globe’s 80-year archive, with a focus on the productions of Shakespeare. Among our very special guest speakers were Barry Edelstein, Erna Finci Viterbi Artistic Director of The Old Globe, and Globe Historian and Globe Guilder, Darlene Davies. Many of our long-time Guilders and newcomers enjoyed themselves on June 16, as we all raised funds for The Old Globe. New treasures from our annual Second Hand Rose event and opportunity drawing were added to our personal collections, with proceeds from the event going to The Old Globe. We enjoyed presentations by two guest speakers who are new to the Old Globe Theatre: Llewellyn Crain, the new Director of Development, and Freedome Bradley-Ballentine, the Director of Arts Engagement. He explained the outreach efforts such as “Globe for All,” “Globe to Go” and AXIS which features free cultural events and programs on the Old Globe’s plaza. Globe Guilders events help fund these programs throughout the year. Holiday Luncheon: December 10, 2015 at the Southwestern Yacht Club in Point Loma. After a lunch of chicken, asparagus tips, potatoes au gratin, and an apple tart for dessert, we were treated to show of Chico’s spring 2016 fashions, modeled by our own Pam, Lisa, Kim, Wendy, and Rachel. Our lovely models did a great job showcasing Chico’s classic and comfortable designs. After lunch and the show, Suzie Poet Turner gave a moving memorial to our beloved 2015 President, Margi Sargis, then turned over the podium with a lovely and entertaining introduction to our incoming President, Angie DeCaro. Awards Night: October 17, 2015 at the Lomas Santa Fe Country Club. Guilders enjoyed a festive evening — with many attendees in costume — to celebrate Halloween and present the Guilder of the Year Award, the President’s Award, the Fashion Show Chair Award, and the Irma MacPherson Award. An additional award was given out this year — for best costume! Photographs by Mona Beizai and Norm Gillespie. 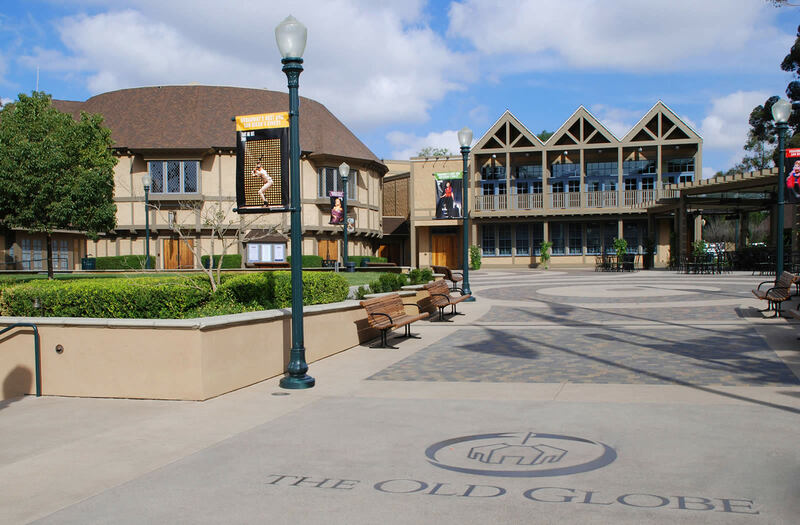 New Member Coffee: September 17, 2015, at the Old Globe. Guilders welcomed prospective members for coffee, juice, fruit, and bakery items for a morning on the front plaza at the theatre. Wendy Ledford, Membership Chair, explained the organization, Darlene Davies provided some lovely historical anecdotes, Michael Murphy expressed his appreciation of the Guilders, and Rachel Plummer explained myriad ways Guilders can be involved with the Glove. Several of the attendees joined the Guilders on the spot! 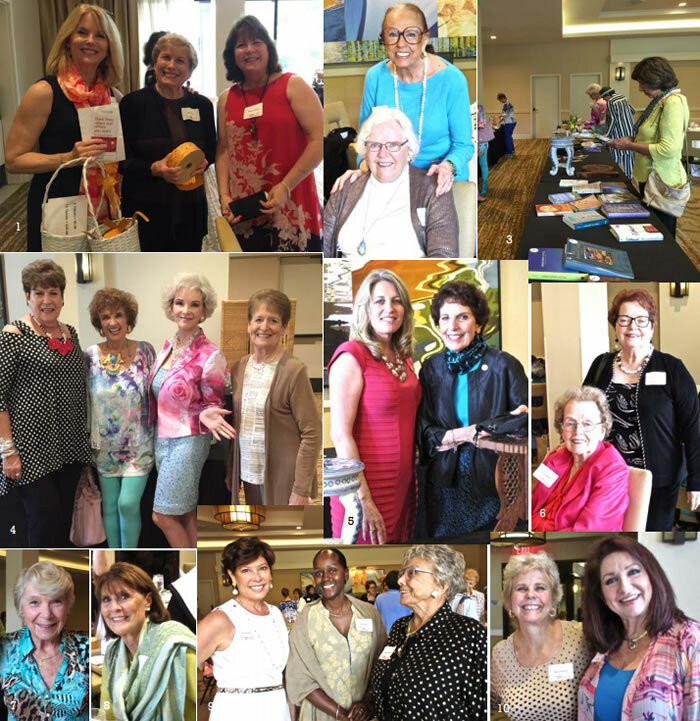 Membership Luncheon: June 26, 2015, at the San Diego Country Club in Chula Vista. Guilders enjoyed champagne and lemonade during the Second Hand Rose sale (which raised $560! ), followed by a fun buffet with 4th of July staples: hot dogs and hamburgers with all the fixings, watermelon, and apple pie à La Mode. We were also treated to a lovely series of folk tales beautifully told by Carol Green. The best part? Welcoming a group of wonderful new Guilders!! Photographs by Norm Gillespie. Patron Party: May 11, 2015, the day before the Fashion Show. It was a gorgeous evening with fine wine, delicious food, and great company. Ann Davies hosted the event for Fashion Show patrons. Professional photographs by F&L Media. MFA Luncheon: February 23, 2015. We had a lovely lunch at Tom Ham’s Lighthouse, followed by a panel introduction (Q&A led by Jane Cowgill) and performance pieces by this year’s MFA students.